Flexibility and speed for marking and pulsed micro-machining. 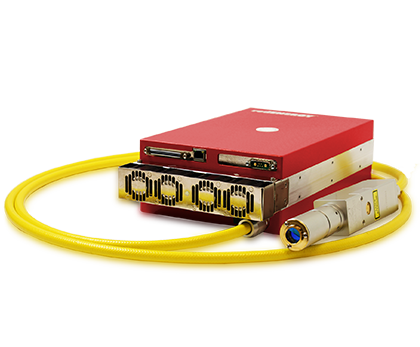 redENERGY® G4 represents our range of pulsed Fiber Laser modules that use GTWave and PulseTune technologies. redENERGY® G4 represents our range of pulsed Fiber Laser modules that use GTWave and PulseTune technologies. Operating in the nanosecond pulse duration regime these Lasers are widely used in a diverse array of applications, offering users unrivalled versatility and flexibility. Click on the product images below to filter through our redENERGY G4 product portfolio; find & download the specification sheet for the ideal Fiber Laser for your application. General purpose (M²<1.6) Higher peak power and pulse energy with only minor increase in spot size over S type. Lasers are the tool of choice no matter what the material as they produce permanent marks with a non-contact process at high speed with high precision. Laser marking requires no consumables and marks are computer generated and are therefore highly flexible. redENERGY® G4 has been designed with specific attention to enhance the ease of OEM integration, enabling easy adoption of the full product features and range. redENERGY® G4 is designed to benefit high volume manufacturing, where it yields unprecedented reliability and consistency. Our G4 model is the 4th generation redENERGY® pulsed laser product platform and is the pinnacle of pulsed nanosecond technology, with enhanced features for micro-machining, moving our PulseTune enabled Lasers to a new level. PulseTune technology offers the OEM integrator highly flexible control over pulse width and peak power. 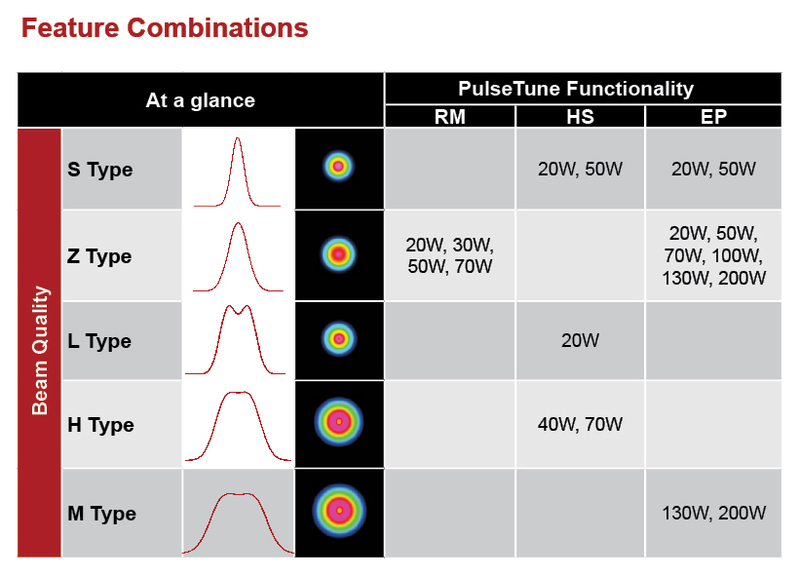 The unique PulseTune function enables market leading repetition rates whilst maintaining peak power. The key differentiator of our redENERGY Pulsed Lasers is the versatility of up to 40 selectable waveforms and the benefits that accompany its flexibility. The ability to optimise key pulse characteristics to individual applications gives enhanced process quality and productivity. Every care has been taken at the design stage to ensure that our products offer a long and maintenance free life. redENERGY® G4 Pulsed Lasers are all maintenance free, utilising ‘Fit & Forget’ technology, allowing you to focus on output, rather than time consuming maintenance schedules. Designed for manufacturability and reliability redENERGY® G4 sets new standards of product quality, backed by an industry leading 3 year warranty as standard. Up to 1 MHz pulse repetition frequency. Pulse width range of 3-2000 ns. Generating very fine spot size <20 microns with high power stability and large depth of focus. Ideally suited to applications requiring small feature sizes. Offering higher peak power and pulse energy with only minor increase in spot size with good depth of focus. General marking applications giving slightly larger spots and features that are more appropriate to making marks visible to the naked eye. Offering high pulse energies, and peak powers and even larger spots ideal for wide lines, filled font type applications and large area coverage. Highest pulse energies and longer pulse durations ideal for welding and cleaning. To place an order or to discuss your requirements in more detail with one of our Fiber Laser experts, either call us direct on +44 (0) 1489 779 696, call a regional office or, complete this form and we will contact you.